I found Sew Stylish Designs Llc on the internet. Sue Berry contacted me in a timely manner by phone. As we chatted I new immediately that she was a true professional and felt very comfortable setting up an appointment to meet with her in my home. Sue brought samples of her work and materials that were just beautiful. 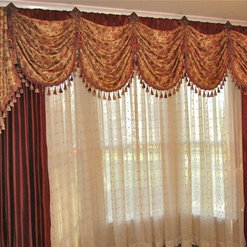 She took the time to listen to what my vision was and she created the most beautiful living room drapes, dining room drapes, table runner and shower curtain for my home. We now have a long term working relationship....I have many more rooms for Sue to do her magic! Looking forward to working with Sue in the near future. 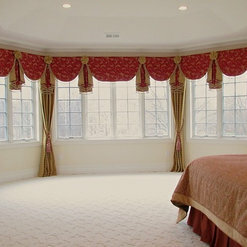 Patty, I'm so thrilled you love your window treatments! 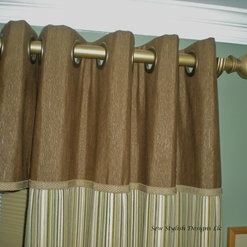 You are such a joy to work with; I'm looking forward to making valances for your kitchen and family room next! Sue was wonderful to work with. She's professional and her skills are impeccable. 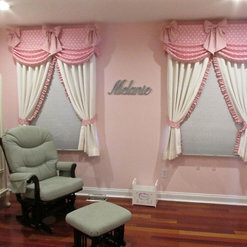 The curtains she made for my family room are gorgeous. I couldn't be any happier. I will definitely use Sew Stylish Designs again! 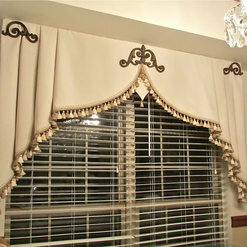 Enza, thank you so much for trusting me on the tableaux valance design. 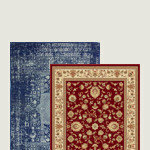 It's such a show-stopper in your already stunning home! We did good work!! Can't wait to work on another project with you. I recently hired Sue to help me with window treatments for my kitchen and sitting area as well as cushions for my kitchen chairs. She was wonderful to work with! Sue has a great eye and was extremely helpful with fabric selection and design. Everything turned out beautiful and was finished exactly when she said it would be! I wouldn't hesitate recommending her! Thank you Michelle. 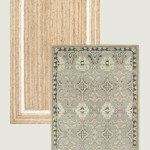 I'm enjoying revamping your whole house color scheme with you, room by room. You're doing a beautiful job! 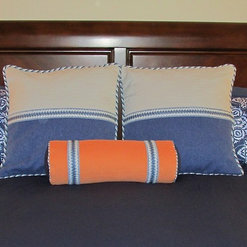 I had been looking for new bedding for my master bedroom with no luck until I found Sue Berry and Sew Stylish Designs. Sue was very friendly, professional, and enjoyable to work with. She was very accommodating to my schedule as we met to choose fabrics from her very extensive inventory of beautiful, high quality fabrics. I am very happy with my finished bedspread and coordinating pillow, and highly recommend to Sue and Sew Stylish Designs for custom sewing projects. Thank you Gail, for that high praise. You had a such a beautiful vision for your bedding, I was so happy to help you make it a reality! From the moment I met Mrs. Sue Berry I felt very confident of having made the right choice to select Sew Stylish Design Llc. 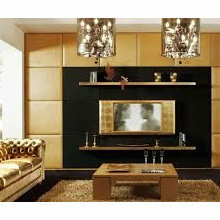 Her advice and guidance in selecting material and design for my project was that of a professional, experienced person. The finished project is of exceptional workmanship and detail. 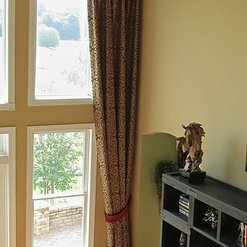 Sue did a fabulous job with our window treatments - they are exactly what we wanted. 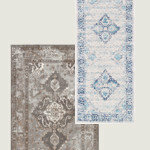 She used her extensive knowledge to guide us in selecting a design and fabric combination. Her attention to detail is phenomenal. Installation was efficient and tidy. We look forward to working with Sue in the future! I am only to happy to recommend Sue Berry for decorating. 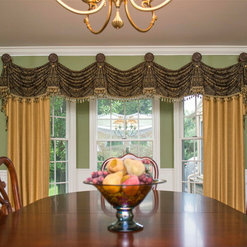 Sue made the window treatments for my kitchen and they are beautiful! I chose the style and had the fabric. She did a fabulous job constructing them and also installing them. Sue has amazing talent and onsite to what the customer wants. The quality of her work is second to no one and I am looking forward to our next project soon! We had our baby nursery done by Sue. She was very receptive to our ideas and worked with us to bring our vision to life. What she came up with was well beyond our expectations, and we absolutely love it!!! 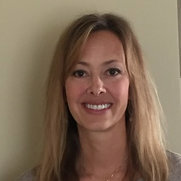 Sue is very meticulous, hard working, and truly cares about making her customers happy. She's great. Found Sue's company online, I am extremely pleased with the outcome. She was professional, responded promptly, the finished product is beautiful. You will not be disappointed with her services. 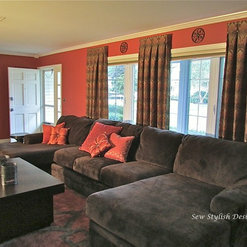 Sue has transformed by living room and dining room into an exquisite area to entertain and enjoy. She is a perfectionist from her artistic designs through to the finished product including the final installation process. Sue is a creative professional who goes above and beyond. I really enjoyed working with her and valued her advice. I have been referring her to my family and friends! Sue was such a pleasure to work with. 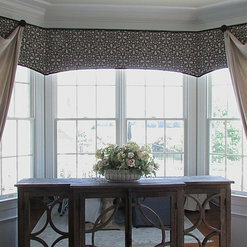 She provided beautiful custom valances above plantation shutters on our living room windows. We are extremely happy with them. Everyone entering our home compliments the look and asks who we used. Thank you Sue!! Linda, I'm so happy to hear that! 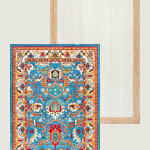 They are such a nice compliment to your already beautiful home. Let me know when the new chair comes! Thank you. Sue Berry was very professional in handling our request for Roman shades in our kitchen/bar area. After searching for a few months at big box stores and unable to find the detail and quality of shade that we wanted, we contacted Sue for her expertise. She was timely, organized and NOT pushy in any way. Additionally, her prices for the shades were "spot on". 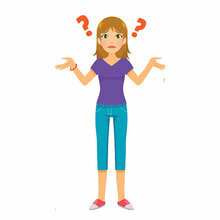 She has a pleasant demeanor and the uncanny ability to determine her clients' wants with very little direction (I initially told her I didn't care for florals, not realizing that all of my curtains were floral patterns). We are so pleased with the Roman shades, how they operate and how they compliment the details of our kitchen, that we intend to contract Sue to carry the pattern throughout our kitchen to the eating area. Sue is a delight to work with as well as true craftswoman! Commented: Wall colourSure it's Benjamin Moore affinity color Agave, number AF-420. Commented: Love valence hangersThanks for your message. They are from Paris Texas.